This last week I have had to seriously curtail my computer time because of the muscle spasms so I’m only now catching up on all my favorite blogs. But I’ve been sewing, both in my head and in real life. Not bad, just a few wrinkles. I started with size 12 and made some flat pattern adjustments based on a Lands’ End T-shirt I wear for sleeping. It measures 14″ from shoulder point to shoulder point and I like where the seams fall. It measures 19.5″ across at the underarm and 17″ at the waist. I wanted a similar fit. I then used the length proportions from the KS3003 because I thought those would be a good start. lengthened sleeve to wrist length. Wrinkles on the left, smooth on the right. I thought the dress looked pretty good but there were some wrinkles I didn’t like. They seemed to be pointing to the bust but pinning a deeper dart didn’t seem to help. It took me a while to figure out what the deal was but when I realized I was pulling up my shoulders as if to shrug, to make the wrinkles disappear, it was clear the shoulder slope was too straight. (It’s not the pattern’s fault; it happened when I re-angled the back armhole.) I have square shoulders so never in a million years would I have thought I’d be making a sloped shoulder adjustment. 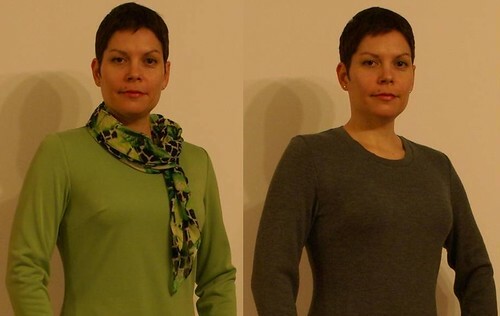 I made it just ¼” on both front and back, and tested it out in a gray sweater knit. Nice and smooth, and perfectly shaped. I love how the back darts show off my lower back curve. After the dress was sewn, I took in the side seams ½” on each side at the waist, tapering up to the bust dart and down to the hip. This helped give it a nicer shape so it can be worn without a belt. The side seam shaping worked well in the gray top, too. For future dress versions, I’ve added 1.5″ to the length so that the hem will come to the top of my knee. For the gray sweater, I used a 2″ strip on the cross grain, folded in half, to finish the neckline. This closed it up a little and made it look more like a crew neckline than the originally intended scoop neck. I usually wear scarves when the weather is cool so it makes little difference here but I wanted to try the technique and add it to my repertoire. This is how I’ll wear it most often – with a scarf. The sleeves look a bit wide from the elbow down and I might taper them a little in the next version. The suggested fabrics for this pattern are both knits and wovens and I am looking forward to trying it out in a wool crepe soon. That’s all I have right now. Or rather, I’d keep typing, only I have to keep my neck muscles happy so it’s time to go. See you soon! Eventhough the green dress looks good, the changes really have helped. Good job. OK, I love the fit of that top. And seriously, every time I see your photo, I am reminded of your excellent posture. Posture is entirely underrated. Wow, they both look great, but your top looks fantastic. Well done! You are so good at reading wrinkles and adjusting your pattern to work them out. I like all of the pieces and I’m glad that you’re neck is finally starting to feel better! Beautiful fit – that top looks perfect. Nice job! This looks fabulous on you. You made it fit your figure perfectly. You knocked out those wrinkles so well. This looks great with that scarf.